Memoir Man is a popular perfume by Amouage for men and was released in 2010. The scent is woody-spicy. The longevity is above-average. It is still in production. I added Memoir Man to my collection about a year ago and haven't really figured it out yet. People like to say that I am someone who talks too much and can't be silenced by anything. Admittedly I feel a certain urge to express my opinion about everything and maybe I am even one of those terrible know-it-alls. I leave it to the psychologist, in my case my hairdresser, to find out which mother/father inferiority complex or attention deficit this urge arises from. You're probably wondering why this egocentric guy is writing about himself. Well, as I briefly mentioned above, I have no clue what to write about Memoir Man, but I still want to tell you somehow (,or just because of it). When I try to describe Memoir Man it's as if I'm stretching out my hands to thoughts that, as soon as I try to grab them, slip like fog through my fingers. Every time I wear Memoir Man or run through my apartment like a lunatic, spraying the scent in front of me, hoping that it might give me a clear idea, I think I am very close to the solution, only to find out again that the scent remains completely closed to me. Of course I could write something here about the scent I perceived. About the fact that I only notice the absinthe at the very beginning, the basil and the mint strongly remind me of summery drinks or salads, that this green impression is reinforced by the tarragon and lavender, sneaking in to a slightly woody and strongly earthy note, all based on a deep mysterious slightly sweet incense base. But that's not my point. I want to understand the scent. His innermost. I want to know why he's talking to me like that. When I am not trying to fathom his "soul", he evokes a deep peace in me. I then imagine that I can think better, that I am in a state of spiritual clarity. But every direct thought of the fragrance makes this peace shatter into countless splinters, which only reassemble when I no longer brood over Memoir Man. Ha, maybe I'm really going crazy. I hope it's not just me. Nevertheless, I would like to express my appreciation for the fragrance. Clearly, the fragrance is a complex, very successful work and promises the wearer one or two compliments. Even if it makes me crazy, the fragrance remains interesting and never gets boring. So I found something to talk about again. In the first moment incense pure,... but there's more. Definitely no scent for the youthful dating gurus - the frankincense note is simply too high for that. I would classify the fragrance (in my jargon) as "serious" and unfortunately "humorless". But in any case it is elegant and noble (especially the bottle). You have to be able to say "no"! So far I've only written comments on fragrances that I've rated at least 7.5. For this reason I would like to write a comment to a smell, which I did not find so good and justify this as accurately as possible. Memoir Man has now still received a 5.0 from me, but compared to the average this is clearly below the general average on Parfumo. Many love this scent and I tell you: It's also good if you love him. You certainly have your own personal reasons and arguments and preferences. That is why I hope that you at least accept my point of view and whoever wants to go further understands it. My thanks go at this point to Fab83, from whom I got the bottling (which has meanwhile been sent further). Perfume is always a personal thing. One underlines his outer nature and his character, possibly also his mood with a scent. Of course, this should also be perceived by others and fit the external circumstances. To be honest, I don't want to smell of absinthe, burnt tobacco or alcohol. These scents are very well made for me at Memoir Man. Unfortunately, it is so authentic that I simply can't imagine that this would cause any positive associations in anyone. Still underline my character somehow. At the most I could get carried away to the spectacularly spicy drydown, if it wouldn't take about 8 hours for this to happen. I want to be fair, too. I think the scents are actually very well done, a scent is given and somehow the composition has something noble and rich. The minty alcohol note in combination with the smoky - I admit it has something! It's really well done and I can absolutely understand it if someone thinks the scent is good. Personally, I really can't do anything with him at all. Even my beloved lavender I tried to smell there. It does stand there but in the whole alcoholic-balsamic turmoil it simply drowns. I can't wear it, I would never buy it and I absolutely can't recommend it to anyone. Even my cousin, who is travelling in gothic style, I would rather advise to wear Lalique's wonderful Encre Noir. I'd wear it even if it rained once and I'm not up for anything. Faith has such days every time. But are these days desirable? I don't think so. Do these days often happen? I hope not! It is a very well made aromatic fragrance that beautifully shows what perfumers at Amouage can do. In spite of this high art, I have to say "No" to Memoir Man myself. Sometimes this art just isn't enough. You must also like it personally and it must suit you. This scent really shocked me, caught me off guard. It's really dark, like the darkest winter day. Saturated, oriental. One can say Sherlock Holmes would wear this, but I believe Prof. Moriarty prefers Memoire. Bitter dampness of dark cellar, while on the table are the plans for conquering the world. Basil and absinthe in the start, soon accompanied by rose, incense, leather and vanilla. Darker than evil soul. Don't wear it on date, you will give the impression of Jack The Ripper's presence. You feel a balsamic dryness should be the Tobacco / Vetiver, but it makes it soft and elegant, recalling some perfumes from the late 80's, but very current. It is very well done, nice, with good longevity. One drawback is its price, although as it is evolving perfumery is already normal the same. One of the nicest frankincense openings on the market: bright, rich, deep, resinous, masterfully blended with bitter green leaves, citrus, something pungent and candied-fruity (like elemi), vetiver, sandalwood, and something on the base which reminds me of castoreum, although it may simply be the “side effect” of vanillin plus woods, leather and citrus notes. Genius touch of dark rose coming and going. A sophisticated hybrid halfway contemporary woody-incense scents like Gucci pour Homme I and resinous-brighter ones like Maria Candida Gentile Exultat, with discreet echoes of classic “barbershop” masculine colognes – mostly because of a soft, and kind of “dark” touch of earthy lavender. Utter pleasure: Memoir Man is a balsamic, refined and cozy gem, stylish and crowdpleasing without smelling dull, shallow or generic, at the same time showing a really peculiar a nondescript sort of “enigmatic” charm. Creative but totally safe, appealing and versatile. Perfect leathery-balsamic greenish drydown with a prominent vetiver-tobacco accord, mellow and again, totally classy, on darker balmy-mossy notes - keeping that abovementioned barbershop-fougère inspiration. Raw but civilized, shady and fascinating, and totally well made and solid... still unworthy the crazy price tag, but really nice. A smoky, bright and uplifting fragrance. In the opening, the immediate two notes I smell are smoke and incense but it's not so much as church incense as it is a bright incense. The woods in the fragrance are more background players than at the forefront. It also has a note that I'm having a hard time placing and it could very well be the absynth, since that's listed as the central note. Quite honestly, I don't know what absynth smells like on its' own, so it's hard for me to say. When it dries down, the bright incense takes over as the dominant note. This was on my want list for quite some time and admittedly, when I first sampled it, I wasn't terribly impressed but later, I went back and tried it again. It was like a drug and I was hooked. This is easily a 10/10 in my book. Do you know how a new TV show starts with an exciting pilot episode and then runs out of ideas in one season? That's pretty much how I feel here. Memoir Man opens up as a radiant green scent, moving from a sharp, freshly cut grass introduction to a darker cold green absinthe, and finally to an aromatic herbal blend. It is all very dynamic, with an impressive complexity from the incense and woods peeking through. Then, the scent transforms into a slightly bitter, incense-amber-herbs combination which I simply don't find very interesting. In the end, it's mainly incense, vanilla, sandalwood left. I get bored by the drydown, which I find unoriginal despite being high quality; besides, it lasts forever and becomes somewhat bothersome. Another problem: the green palette so vibrant and fresh on a blotter becomes muted and dull when I am wearing Memoir Man. Maybe it's the olfactory fatigue, but even with a light application on my skin, the scent looses a lot of its lustre. What a pity. Memoir Man is not bad, especially if the drydown is to your liking. Unfortunately, this offering from Amouage appears to me more like a project where the bland ending is no match for a brilliant start. Intriguing, refined, complex, anomalous, unprecedented. Yes, in that order. I have never smelled anything quite as royal and polished as Memoir Man. Never stepping foot in Oman, I'm feeling nostalgic about a place I have yet to see or come close to. The notes all work as a perfect ensemble, one complimenting the other. The finest herbs, flowers, resins and woods create an unstoppable force. Dark, smoky, mysterious, confident and announced. If I had to pair this fragrance with a fictional character, I'd imagine this is a fragrance Bruce Wayne would wear as this is the Dark Knight of the Amouage collection. The opening is fresh and really incredible, but all too brief. Then the scent takes a radical change on my skin and just smells like burnt tire rubber. Longevity is rather poor on me as well. Bulgari Black does the tire rubber note much better and for1/8 the price. I wish the opening notes stayed around longer on Memoir, because they really make me want to give this one a better score on their strength alone... Oh well, 2.5 stars out of 5 is all I can muster. After so many Parfumo users having pushed this fragrance to no. 1 of the top list, I get curious if there might be something special about it. I admit, Memoir Man is not bad enough for a slating review. A stylish flacon, a mysteriously oriental brand name and twice the price as usual for a decent perfume – and people buy it like mad. Amouage knows the ropes, that is for sure! Memoir Man is a decently made smoky resinous fragrance. Top and middle notes have an attractive appeal with green and herbaceous, yet dark and resinous parts. I especially like that all different notes at first were mingled to give you a homogeneous impression. It may be difficult to smell any of these notes separately. Getting near the base notes, Memoir Man becomes more streamlined. It becomes smokier and more resinous, in parts even bitter. It had to ponder a while where it was that I had smelled this combination before, but then it came to my mind: Intricate and Complex, the twin fragrances by Boadicea the Victorious! There it is again, that imagination of cold cigar ash which I especially get from the expensive Inricate. These two Boadicea fragrances are hardly wearable due to their excessively intense way. But in Memoir Man, everything is decently diluted and brought down to the tolerance limit of a global audience. Dosis venum facit, and a tiny whiff of smoky-resinous ash is apparently appreciated by many – but not by me. I like it smoky, but not resinous. Of course, this is a matter of personal taste. On the other side: what would be the outcome of a blind test: Memoir Man versus the really noble and wearable smoky L'Homme Sage by Divine? It is reasonable that this Memoir is marketed as a men's fragrance. In spite of its dark and bitter style I do not find it particularly masculine. In my mind I see a still sporty elderly lady with a dark complexion who wants to emphasis a distinctive harsh kind of femininity. 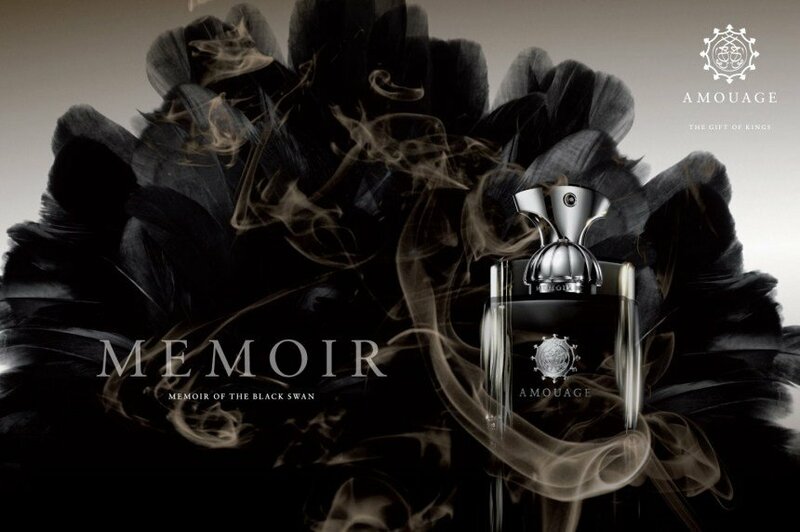 One can regard Memoir Man as a deep black fragrance. 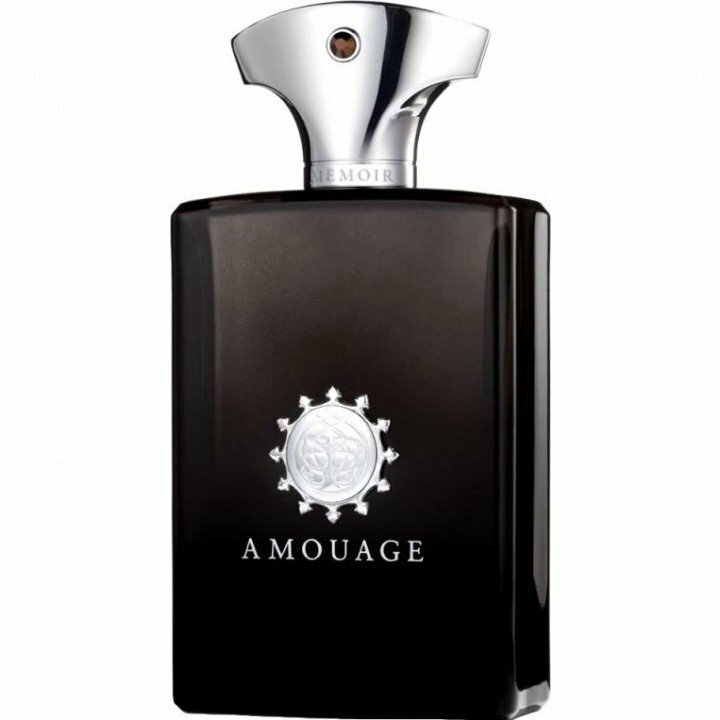 Its success bay be founded on the fact that Amouage made this fragrance quite wearable. It may appeal to an advanced audience with a developed sense for uniqueness, an affection towards dark romance, and with being past any loud perfumes with big bang effect. But is this Amouage perfume beautiful? Memoir Man starts with a little scent-firework, that’s anybody wake up and say: here happens something. And what happens has his price. Cause Memoir Man take themselves very patronize and show us a small olfactory world fuel with precious and select ingredients. I didn´t notice the mint, but more of the tarragon, that would be more and more loud. And than come a small surprise. Memoir Man cited in a short time frame the basics of Jil Sanders Feeling Man. In conclusion both fragrances shares tarragon, lavender and assured something more. Yeah – so I like it and so I have a good feeling. And even that, what´s come after this, is more than good: a rich warm woody scent. It’s the same, if you dipping dark honey on a tropical wood and dry it by the setting sun. I think that’s a part of the gaiac wood. An awesome nuance, that could be more intensive. On the other side, the longevity of Memoir Man is for me not the best. After an hour I smell only light vanilla basics on my skin. Finally the comparative high price is a little bit excessive. I can´t remember to have to much money for something like this.